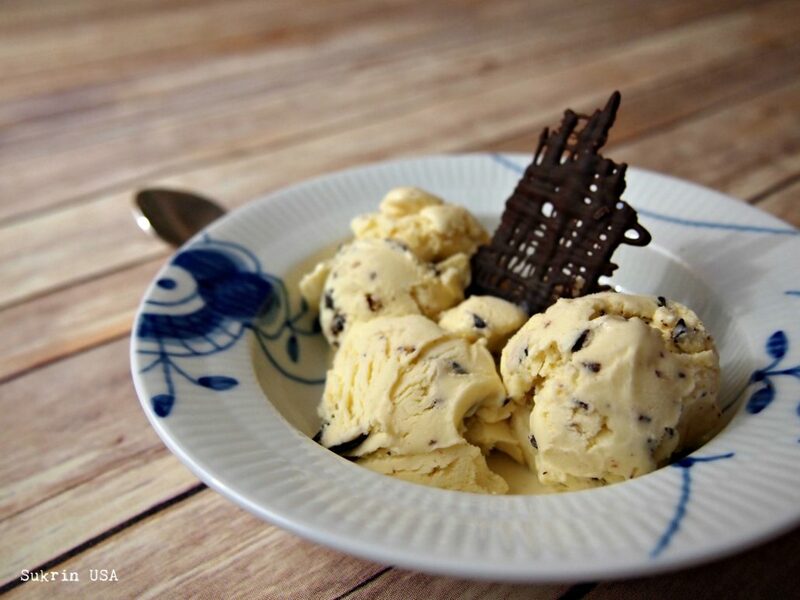 Vanilla Belgian Almond Ice Cream is just 2 NET CARBS per serving! 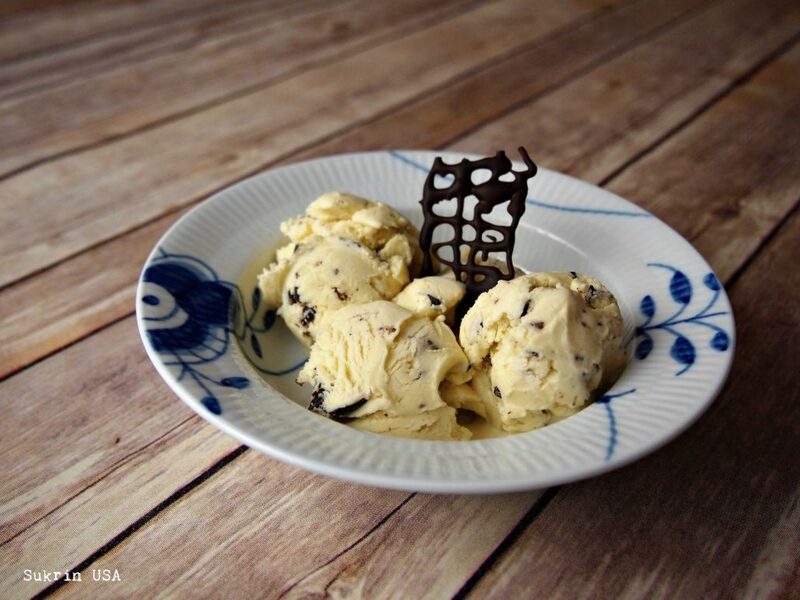 Has anyone ever tried the Vanilla Swiss Almond ice cream from Häagen-Dazs®? It is delicious – but it has corn syrup and 24 carbs per serving:-( So, we set out to make a copycat ice-cream with the same taste but ingredients suitable for a low carb diet. And it came out absolutely delicious – some would even say almost better than the original! And, with all natural non-GMO ingredients and just 2 net carbs per serving it is definitely worth a try. The combination of the two types of sweeteners eliminates any weird aftertaste that might have been the result of using just one sugar substitute – and both of these sweeteners dissolve easily and will, in combination, prevent the ice cream from becoming crystallized and/or rock hard! *The vanilla extract should have nothing but vanilla and alcohol in it. 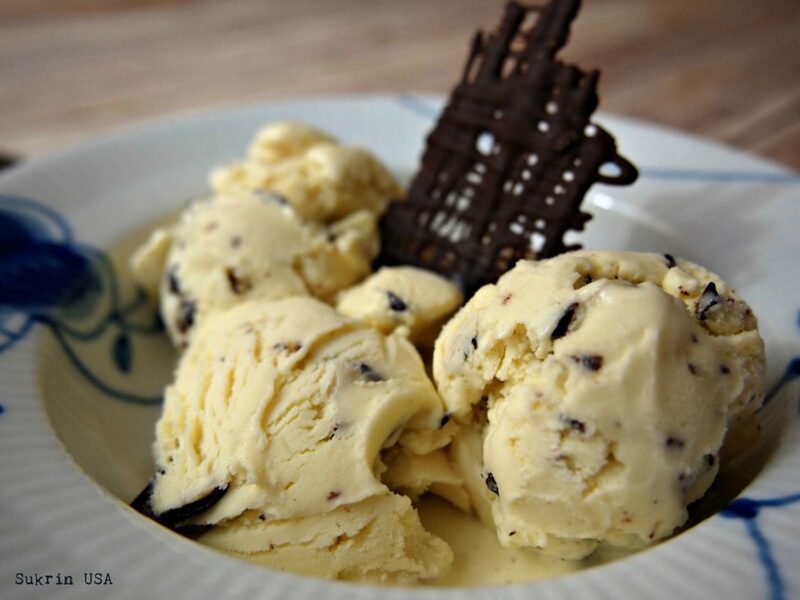 Some have propylene glycol in the ingredients which is anti-freeze – definitely not what you want for your ice cream. If you’re using an ice cream maker with a pre-frozen bowl, make sure the bowl has been frozen for the required time – typically at least 16 hours. Whisk together egg yolks, Tagatesse, Sukrin Melis, vanilla extract and salt until thick and creamy. Pour cream into a sauce pan, add the egg mixture and whisk over very low heat. You need to keep whisking and the mixture cannot get any hotter than warm – you don’t want it boiling! Remove from heat, cover and leave in fridge until cool, preferably overnight. Meanwhile, prepare the Belgian Almonds. Melt the chocolate over steam or in the microwave. Add the almonds, churn to make sure they are covered and separate the chocolate covered almonds on a piece of parchment paper. They firm up very nicely in the fridge. Cut them up in chunky bites and keep them cool. Churn the ice cream mixture in your ice cream maker until the consistency is like thick soft serve ice cream – typically 20-60 minutes. We used a Kitchenaid Ice Cream attachment and it took about 20 minutes. Fold in the chopped chocolate almonds. Enjoy immediately or freeze for later, possibly in single serve containers.